One of Harrison’s most famous works is the Viriconium fantasy series, now available in a single volume. “Viriconium” is a compendium of a series of four books which are perhaps too loosely connected to really be accurately described as a 'series'. The subject of the series is the city of “Viriconium”, the last remaining great city in a world that has been exhausted by the works of millennia of preceding cultures. The people of this world largely make a living by scavenging the amongst the ruins of the last of the 'Afternoon Cultures', digging up great machines of unknowable purpose and rendering them down to produce swords and simple implements – or else using these artefacts as centrepieces of collections of works of art whose purpose the world has long since forgotten. 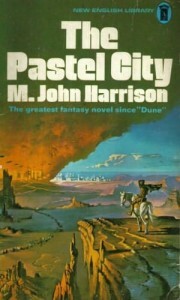 The earliest – and most accessible – novel in the compilation is “The Pastel City”, a comparatively conventional epic fantasy tale. The lead character is tegeus-Cromis, a poet and expert swordsmen who was part of a band of warriors known as the “Methven”, a group of adventurers who served King Methven, the ruler of Viriconium. After his death, the Methven dispersed and the King's young daughter ascends the throne. A decade later, the Queen's cousin has raised an army among the wild Northmen and she is poised to invade Viriconium. Viriconium's army is ill-prepared for battle, despite possessing the last few of the Afternoon Culture's flying ships and power-weapons. Cromis sets off to find his old companions – the violent metal prospector Tomb the Dwarf, warrior and smuggler Birkin Grif and the lecherous Theoderis Glyn. As well as locating his old companions, he also has a strange encounter with a talking bird made entirely of metal, which insists that they are in great danger from something called the gheteit chemosit, and they must go at once to a lonely tower to consult with Cellur, an expert on the Afternoon Cultures. They ignore the unnecessarily vague warnings but soon discover that the Northmen have managed to resurrect some of the Afternoon Culture's most dangerous technology. This is the most conventional of the Viriconium tales – although the setting is reasonably original and nicely rendered, the plot falls into the typical fantasy quest category. The characters are generally likeable, and although they have no great depth the characterisation is competent. 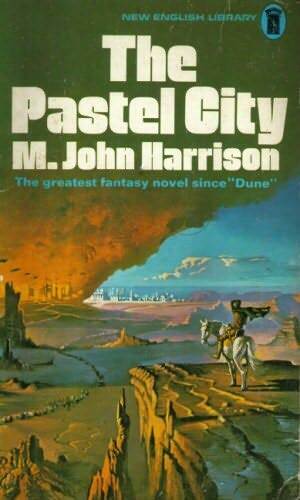 Like all of Harrison's work, it is the quality of the writing that is notable here, although it's not as impressive as “Light” (for example), Harrison manages to effortlessly evoke a deeply melancholic atmosphere of the remnants of humanity trying to rebuild past glories on a worn-out world. The menacing gheteit chemosit are convincingly sinister and the battle scenes are described concisely but effectively. It does have a fairly abrupt ending, Harrison choosing not to chronicle the final days of the war except in a brief epilogue. Although the plot may not be entirely original, it is generally well-written with a memorable setting and it is also more comprehensible than some of the later Viriconium stories, and is thus possibly the best of the series. The second novel is “A Storm of Wings”, set several decades after the end of “The Pastel City”. The plot is less conventional this time, as Viriconium is menaced by swarms of giant alien locusts, unable to survive on Earth and desperately trying to re-imagine the world in a way more suitable for them. This has a devastating effect on the humans of Viriconium as their reality starts to collapse and merge with the alien world of the insects. Increasing numbers of humans convert to the Sign of the Locust, a nihilistic philosophy that believes the world doesn't really exist. The followers of the Sign have particular hatred for the 'Reborn', a group of humans from the Afternoon Cultures who were resurrected by Tomb the Dwarf. The Reborn have their own problems, they can only remember their previous existence fleetingly, and many of their people become obsessed with trying to regain the memory of their past lives – to the extent that they start to lose their grip on the reality of living in Viriconium. Somehow Tomb the Dwarf and Galen Hornwrack, a disillusioned assassin looking for a purpose in life, must find the source of the Locusts, and find a way to destroy them. They are helped, and sometime hindered, by the greatest lord of the Reborn, Alstath Fulthor, the incoherent ghost of long-dead airman Benedict Paucemanly and Fae Glass, a Reborn who knows the location of the insect's lair but is too lost in her memories of the past to be able to communicate with her companions. The plot is impressively original, and although it is slightly vague at times it is still possible to follow the progress of the story. There are plenty of – often abstract – philosophical ideas presented here, and the plot is impressively integrated with those ideas. In another novel, the fact that many of the characters are often confused and lost in incoherent memory might be a disadvantage, but Harrison cunningly makes this the main point of the plot. As ever, Harrison's prose is excellent, although this is not his best work it does still portray his immense talent for writing. The atmosphere is melancholy, wistful and slightly depressing. Fortunately, the novel is short, less than 200 pages (which makes it the longest Viriconium novel) so the nihilism doesn't have time to get too depressing. This is a highly original, probably unique piece of fantasy that may not be an entirely straightforward read, but is still clear enough to be enjoyable. “In Viriconium” (also published under the title "The Floating Gods"), the third novel in the Viriconium cycle is only tenuously connected to the previous novels – indeed it's debatable whether it really takes place in the same city at all, as characters seemingly killed in previous novels reappear here, in different circumstances. 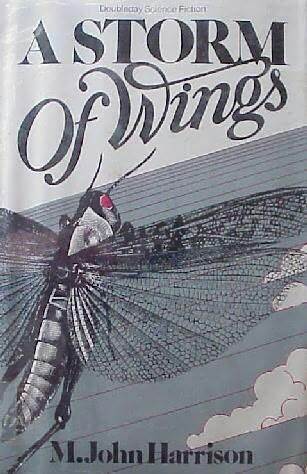 The plot makes the story of “A Storm of Wings” look conventional, it is contained entirely in the City and even at the end it is unclear what has actually happened. The main character is Ashlyme, a portrait painter in Viriconium who is determined to rescue one of his subjects – Audsley King, a fellow artist – from the quarantined plague zone. A mysterious blight is spreading in Viriconium, areas it touches seem curiously dimmed and the people inside start to sicken. Meanwhile, a mysterious pair of ruffians known as the Barley Brothers – who claim to have invented the city – are seen everywhere doing incomprehensible mischiefs. King lives in one of the plague areas, but she refuses to move to the nobility's quarters in the High City out of a disdain for the bankrupt culture of Viriconium's upper classes. Ashlyme and Emmet Buffo, a senile astronomer, resolve to kidnap King for her own good, with the dubious aid of The Grand Cairo, a violent and eccentric dwarf who controls the Quarantine Police and lives in perpetual fear of the Barley Brothers. The plot meanders, and there's little real action to speak of. In the hands of a lesser writer, this could be tedious but Harrison's writing provides sufficient reason to keep reading. Nevertheless, although Harrison's prose keeps some interest it is difficult to care about the plot (such as there is), and the characters are bland, and their actions often seem arbitrary. It may be well written, and it's certainly different, but ultimately it could be said that Harrison is wasting his considerable talent on a slight story with little purpose. The ending is abrupt, and fails to really resolve anything, if Harrison had an aim in this story it's too well-hidden for me to find. The final volume contained in “Viriconium” is “Viriconium Nights”, a collection of short stories that are randomly interspersed between the three novels. This shares strengths – some nicely poetic writing – and weaknesses – irritatingly vague characterisation and incoherent plots – with “In Viriconium”. None of the short stories are an easy read, and it's frequently difficult to find either a point or a plot. They may be nicely written, but there's no real discernible point to them and no matter how well written a story is, it's impossible not to be disappointed when the story ends and the reader is left with no real idea of what just happened, or what ideas Harrison might have been trying to convey. They are possibly interesting as curiosities, and for Harrison's excellent prose, but other than there seems little point in reading such incomprehensible ramblings.